Whether it’s for work or school, a diary is an essential tool for keeping track of client appointments and work meetings, or your homework and timetable. So, for a smart return to work or school, OXFORD is enhancing the functionalities of its SCRIBZEE® app with a new calendar! Usable with all 2017/2018 OXFORD diaries with special markers, this will be a great way to get organised. With a copy saved to your smartphone, you’ll always have the information you note in your diary within reach. Business people can be sure not to miss anything, even if they leave their notebook at home or at the office. And for students, the days of rummaging through your bag to check your homework or timetable for the day are over. 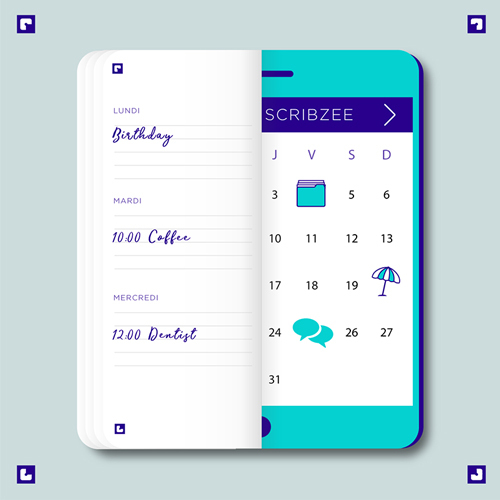 When you scan the pages of your diary, the notes for each date are automatically archived in SCRIBZEE®’s “Calendar” function, by day or week, depending on the format of the diary (daily or weekly). Pages of undated content (grades, lists, your monthly schedule, list of subjects or professors) are automatically filed in the SCRIBZEE® “Notes” directory, in an automatically created folder with the same name. Finally, the diary’s “Notes” pages are sent to the “Pending” area so that you can file them later in the folder you choose. Once the pages from the diary have been added to SCRIBZEE®, you can view them whenever you want, manually create alerts and share them (by SMS and e-mail or on social media). If an appointment is cancelled or amended, you just need to scan the page again for it to overwrite the previous file automatically. Pros are always on time for their appointments! Alerts are automatically scheduled in the SCRIBZEE® calendar for appointments at a set time (e.g. a meeting between 10 and 11 am) in OXFORD professional diaries. Just draw a line in the special margin provided.